The Germanic peoples underwent gradual Christianization in the course of Late Antiquity and the Early Middle Ages. By AD 700, England and the Frankish Empire were officially Christian, and by 1100 Germanic paganism had also ceased to have political influence in Scandinavia. In the 4th century, the early process of Christianization of the various Germanic people was partly facilitated by the prestige of the Christian Roman Empire among European pagans. Until the decline of the Roman Empire, the Germanic tribes who had migrated there (with the exceptions of the Saxons, Franks, and Lombards, see below) had converted to Christianity. Many of them, notably the Goths and Vandals, adopted Arianism instead of the Trinitarian (a.k.a. Nicene or orthodox) beliefs that were dogmatically defined by the Catholic Church in the Nicene Creed. The gradual rise of Germanic Christianity was, at times, voluntary, particularly among groups associated with the Roman Empire. From the 6th century, Germanic tribes were converted (or re-converted from Arianism) by missionaries of the Catholic Church. Many Goths converted to Christianity as individuals outside the Roman Empire. Most members of other tribes converted to Christianity when their respective tribes settled within the Empire, and most Franks and Anglo-Saxons converted a few generations later. During the centuries following the Fall of Rome, as the schism between the dioceses loyal to the Pope of Rome in the West and those loyal to the other Patriarchs in the East grew, most of the Germanic peoples (excepting the Crimean Goths and a few other eastern groups) would gradually become strongly allied with the Catholic Church in the West, particularly as a result of the reign of Charlemagne. In the 3rd century, East-Germanic peoples migrated into the steppes, north of the Black Sea in what today is South West Ukraine, Crimean Peninsula and from there to Bessarabia and today's Romania. The Greuthungi or Ostrogoths lived in Bessarabia and the Thervingi lived in the provinces of Moldova and Valachia, which they called Caucaland. Gothic culture and identity emerged from various East-Germanic, Sarmatian, local Dacian, and Roman influences. In the same period, Gothic raiders took captives among the Romans, including many Christians, and Roman-supported raiders took captives among the Goths. Ulfilas, or Wulfila, was the son or grandson of Christians from Sadagolthina in Cappadocia who had been taken captive by the Goths. In 337 or 341, Ulfilas was sent by Arian emperor Constantius II to preach to the Goths in their language, and became the first bishop of the (Arian Christian) Goths. By 348, one of the (pagan) Gothic kings (reikos) began persecuting the Christian Goths, and Ulfilas and many other Christian Goths, fled to safety within the Roman Empire's borders. Figure carved on the Frankish grave stele of Niederdollendorf (7th century), known as the earliest material witness of Christian presence in the German Rhineland; the figure is presumably a depiction of Christ as a heroic warrior wielding a lance, with a halo or crown of rays emanating from his head. The pagan Franks, who had been migrating to Gaul from the 3rd century, with their ruling Merovingian dynasty converted to the orthodox faith of the Catholic Church on Christmas Day in 498, following the Battle of Tolbiac, when Clovis I converted and was baptised at Rheims. The details of this event have been passed down by Gregory of Tours who recorded them many years later in the 6th century; After their conversion he portrayed the Franks as fighting against Arian heretics and barbarians. But instead the evidence indicates that Clovis failed to cause religious disagreement between the Arian Visigoths and the Gallo-Romans, and there is no indication that religion was the motivation for the wars. Many of the Frankish aristocracy followed Clovis in converting to Christianity, but the conversion of all his subjects occurred after considerable effort and in some regions over the next two centuries. The Chronicle of St. Denis relates that, following Clovis' conversion, a number of pagans who were unhappy rallied around Ragnachar, who had played an important role in Clovis' initial rise to power. Though the text remains unclear as to the precise pretext, Clovis had Ragnachar executed. Remaining pockets of resistance were overcome region by region, primarily due to the work of an expanding network of monasteries. The Alamanni became Christians only after a period of syncretism during the 7th century, by gradual emulation of the new religion of the Merovingian élite. The Lombards adopted Catholic Christianity as they entered Italy, also during the 6th century. Until 1066, by which time the Danes and the Norse had lost their foothold in Britain, theological and missionary work in Germany was largely organized by Anglo-Saxon missionaries, with mixed success. A key event was the felling of Thor's Oak in 723 near Fritzlar by Boniface, apostle of the Germans and first archbishop of Mainz. Eventually, the conversion was imposed by armed force and successfully completed by Charles the Great (Charlemagne) and the Franks in a series of campaigns (the Saxon Wars), starting in 772 with the destruction of their Irminsul and culminating in the defeat and massacre of Saxon leaders at the Bloody Verdict of Verden in 787 and the subjugation of this large tribe by forced population movements of Saxons into Frankish territory and vice versa. 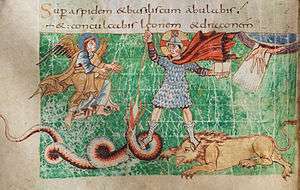 Christianization of Anglo-Saxon England began around AD 600, influenced by the Gregorian mission from the south-east and the Hiberno-Scottish mission from the north-west. Gregory I sent the first Archbishop of Canterbury, Augustine, to southern England in 597. The process of conversion usually proceeded from the top of the social hierarchy downwards, generally peacefully, with a local ruler choosing to convert, whereupon his subjects then also nominally became Christian. This process was often only partial, perhaps due to confusion as to the nature of the new religion, or for a desire to take the best of both traditions. A famous case of this was king Raedwald of East Anglia, who had a Christian altar erected within his pagan temple. His suspected burial place at Sutton Hoo shows definite influences of both Christian and pagan burial rites. Conversion of the Germanic tribes in general took place "top to bottom" (Fletcher1999:236), in the sense that missionaries aimed at converting the Germanic nobility first, who would then impose their new faith on the general population. This is attributable to the sacral position of the king in Germanic paganism: The king is charged with interacting with the divine on behalf of his people, so that the general population saw nothing wrong with their kings choosing alternate modes of worship (Padberg 1998:29; though Fletcher 1999:238 would rather attribute the motivation for conversion to the workings of loyalty-for-reward ethics that underpinned the relationship between a king and his retinue). Consequently, Christianity had to be made palatable to these Migration Age warlords as a heroic religion of conquerors, a rather straightforward task, considering the military splendour of the Roman Empire. From the 16th century the Protestant Reformation erupted, which took hold almost exclusively in territories where Germanic languages are spoken (the Netherlands, Germany, Scandinavia, Britain). The last German Emperor to be crowned by the Pope was Maximilian I in 1493. The religious division eventually generated The Thirty Years War (1618–1648) which ultimately led to the Peace of Westphalia (1648) and the confessional division of Germanic Christianity that exists to this day: most of Austria, Luxembourg, Southern (especially, Bavaria) and Western Germany (notably Saarland and Rheinland part of Nordrhein-Westfalen) remained Catholic while Northern and Eastern Germany (notably Prussia) remained Lutheran. Under the Peace, the religion of the Lutheran or Catholic ruler determined the religion of his subjects. The last German Pope, Benedict XVI, was born in Southern Germany (Bavaria) and was a product of this confessional division. The Romance speaking territories remained Catholic (with the exception of Geneva, where Calvinism originated) while Scandinavia remained Lutheran. ↑ Bernadette Filotas; Pontifical Institute of Mediaeval Studies (2005). Pagan Survivals, Superstitions And Popular Cultures In Early Medieval Pastoral Literature. PIMS. pp. 39–. ISBN 978-0-88844-151-5. Retrieved 14 March 2013. ↑ Richard P. McBrien (12 May 1995). The HarperCollins Encyclopedia of Catholicism. HarperCollins. pp. 558–. ISBN 978-0-06-065338-5. Retrieved 14 March 2013. ↑ Jamie Wood (20 March 2012). The Politics of Identity in Visigothic Spain: Religion and Power in the Histories of Isidore of Seville. BRILL. pp. 26–. ISBN 978-90-04-20990-9. Retrieved 19 March 2013. ↑ Philostorgius via Photius, Epitome of the Ecclesiastical History of Philostorgius, book 2, chapter 5. ↑ Jamie Wood (20 March 2012). The Politics of Identity in Visigothic Spain: Religion and Power in the Histories of Isidore of Seville. BRILL. pp. 32–. ISBN 978-90-04-20990-9. Retrieved 19 March 2013. ↑ Dairmaid MacCulloch, THE REFORMATION, 1st ed. (New York: Viking, 2003) 266, 467-84.